Pan Am 73 • Gadhafi's fall brings hope, but Pakistani expatriate still waiting for justice. 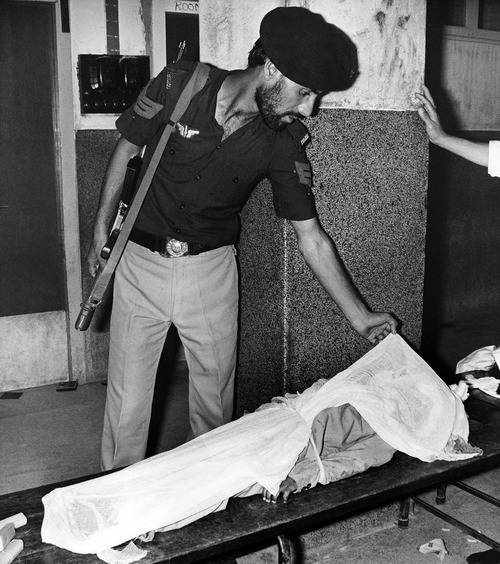 A Pakistani policeman corrects the cover of the dead body of a child in the Karachi , Pakistan, Jinnach Hospital on Friday, Sept. 6, 1986. This child is one of the 14 passengers of a Pan Am airliner that lost itís life during the shootout in the plane between hijackers and army commandos. More than 50 other people were injured and now under medical care in various hospital in Karachi. (AP Photo/Michel Lipchitz) Chris Detrick | The Salt Lake Tribune Javaid Majid poses for a portrait Tuesday August 23, 2011. Javaid Majid was on Pan Am 73 when it was hijacked on September 5, 1986, while on the ground at Karachi, Pakistan, by four armed men of the Abu Nidal Organization. Chris Detrick | The Salt Lake Tribune Javaid Majid poses for a portrait Tuesday August 23, 2011. Javaid Majid was on Pan Am 73 when it was hijacked on September 5, 1986, while on the ground at Karachi, Pakistan, by four armed men of the Abu Nidal Organization. 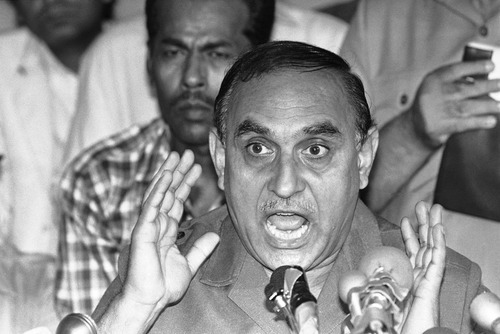 Air Marshal Khurshid Anwar Mirza, director general of Pakistan civil aviation authority explains a point during an impromptu press conference in Karachi, Pakistan after Arab-speaking hijackers stormed the Pan-Am New York-bound flight, Sept. 5, 1986. (AP Photo/Moin Bangsh) Unidentified passengers from the hijacked Pan Am airliner sit in an official government truck being brought to the local Jinnach hospital for medical treatment in Karachi, Pakistan on Friday, Sept. 6, 1986. The passengers were injured in a shootout in the plane that broke out during a power blackout in the hijacked airliners between Pakistan army commandos and the hijackers. 14 people died in the fight, more than 100 were injured. 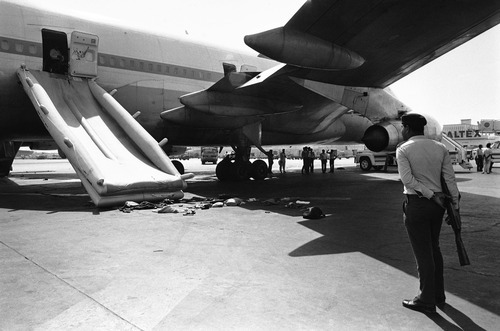 (AP Photo/Liu Heung Shing) Pakistani policemen investigate the Pan Am jetliner under the emergency chute in Karachi, Pakistan on Saturday morning, Sept. 6, 1986. The American aircraft had been hijacked one day ago by a group of four and during a shootout on the plane 14 people died and more than other 100 passengers were injured. Underneath the chute, on which some passengers escaped, are some belongings of them still on the tarmac. 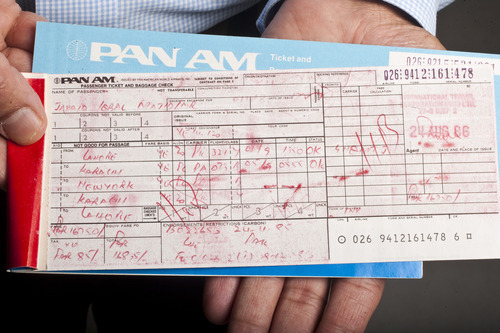 (AP Photo) Chris Detrick | The Salt Lake Tribune Javaid Majid has kept the airline ticket from his hijacked Pan Am 73 flight for nearly a quarter century. Majid, now of Millcreek, survived a daylong standoff aboard the airline that left 20 people dead and 120 wounded. Chris Detrick | The Salt Lake Tribune Javaid Majid poses for a portrait Tuesday August 23, 2011. Javaid Majid was on Pan Am 73 when it was hijacked on September 5, 1986, while on the ground at Karachi, Pakistan, by four armed men of the Abu Nidal Organization. Pakistani policemen stand under the main engine and the emergency chute of the Pan Am jetliner 073 in Karachi on Saturday, Sept. 6, 1986, one day after it had been hijacked by a group of four. Some of the passengers and of the crew members escaped via the chute into freedom after a shootout broke out on the plane during a power blackout between the hijackers and an army commando. 14 people died, more than 100 were injured and hospitalized. 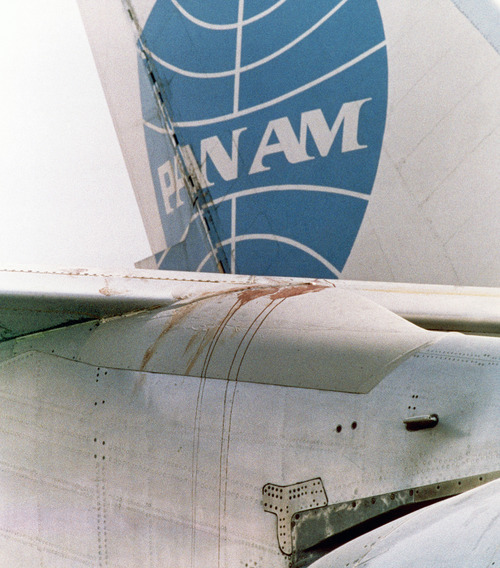 (AP Photo/Michel Lipchitz) Bloodstain is seen on one of the wings of the Pan Am jetliner on the Karachi Airport, Pakistan on Sept. 6, 1986, more than 24 hours after the bloodbath in the plane after a dramatic end of a hijack. After a shootout between the hijackers and an army commando in the aircraft 14 people died and more than 100 were injured. 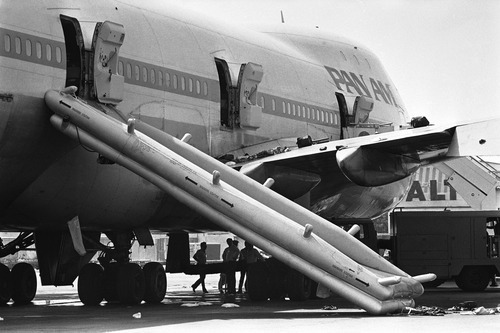 (AP Photo/Michel Lipchitz) A Pakistan policeman stands with his rifle at the Pan Am jetliner under the emergency chute in Karachi, Pakistan on Saturday morning, Sept. 6, 1986. The American aircraft had been hijacked one day ago by a group of four and during a shootout on the plane 14 people died and more than other 100 passengers were injured. Underneath the chute, on which some passengers escaped, are some belongings of them still on the tarmac. 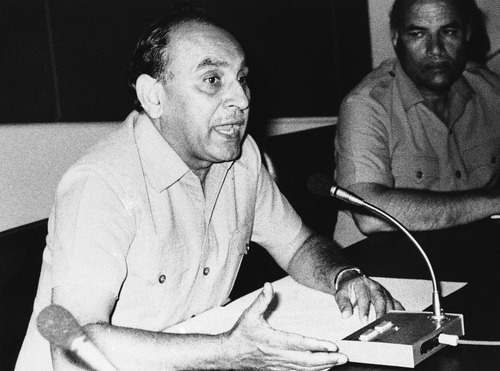 (AP Photo/Michel Lipchitz) Pakistani air marshal Khurshid Anwar Mirza, who led the negotiations on Friday with the hijackers of the PAN AM jetliner 073, gestures as he answers questions of reporters during an international press conference at the Karachi airport, Pakistan on Sept. 6, 1986. 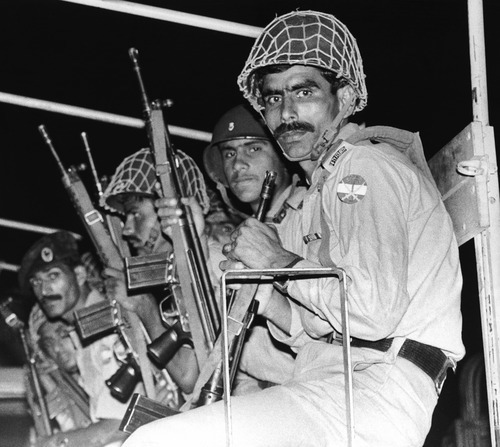 (AP Photo/Heung Shing Liu) Pakistan army commandos with their automatic rifles ride the army truck as it entered the airport in Karachi, Pakistan on Friday, Sept. 6, 1986. After there was a power black out aboard the Pan Am plane, the hijackers began shooting the passengers and the army commandos stormed the plane and it resulted with 14 passengers killed and 2 hijackers dead. (AP Photo/Liu Heung Shing) Mr. Jiwan Nagag from Karachi is comforted by a medical worker and by a relative in the Jinnah hospital in Karachi, Pakistan on Friday, Sept. 6, 1986. 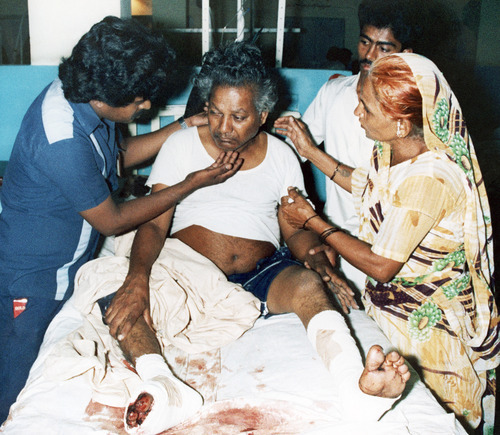 The Pakistani is among those wounded people, who were on the Pan Am flight that was hijacked and later was the scene of a shootout between the hijackers and army commandos. 14 people died in the shootout. 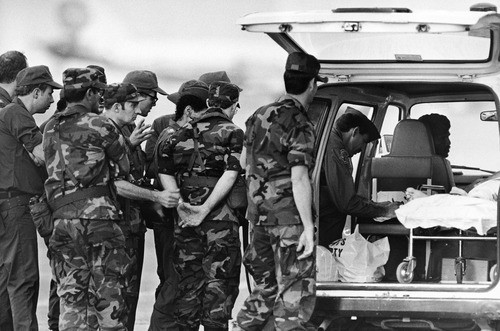 (AP Photo/Michel Lipchitz) American soldiers stationed in West Germany line up behind an ambulance car on the tarmac of the Karachi airport in Pakistan on Saturday, Sept. 6, 1986. The soldiers arrived here to fly out the wounded people to Germany after they suffered injuries in the shootout on Friday in the hijacked Pan Am jetliner 073. (AP Photo/Liu Heung Shing) Eds. note: the shadow behind the soldiers is the Pan Am aircraft, that was hijacked. There is no forgetting the fall. 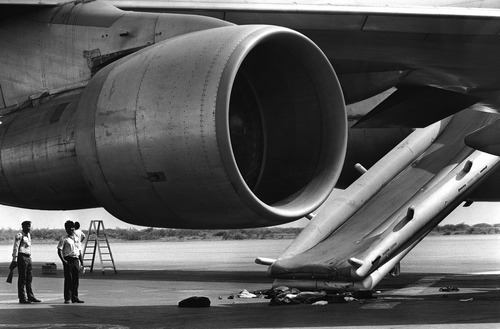 It was a bone-chilling, two-story drop from the wing of a grounded Boeing 747. But Javaid Majid, now of Millcreek, didn't hesitate a second before jumping. It was the only escape from the gunfire and grenade blasts that marked the violent end of the Pan Am 73 hijacking, in which four terrorists with Libyan ties opened fire on a crowded airline cabin full of hostages after a 16-hour siege that left 20 dead. "What they did to us," Majid began, his voice wavering. "You can never forget those moments  every second of those 16 hours. I have tried to forget for 25 years." As Majid approaches the 25th anniversary of that hijacking  on Sept. 5  his sentiments are bittersweet. On the one hand: The regime led by Libyan strongman Moammar Gadhafi, long believed to be responsible for the hijacking, has crumbled. Rebels have stormed the capital and effectively deposed the 42-year dictator. Gadhafi's whereabouts remain unknown, and U.S. President Barack Obama has declared his rule over. "That will be such a closure to me," Majid said, "to have the terrorists get out of this country and bring peace to these people." On the other: Majid has fought unsuccessfully for two years for a portion of the settlement between the U.S. and Libyan governments for $1.5 billion in outstanding terror-related claims  some of which was set aside for Pan Am 73 victims. Despite a letter to Obama, pleas for help from Utah's congressional delegation and a formal claim through the U.S. Department of Justice's Foreign Claims Settlement Commission, Majid hasn't seen a dollar of that settlement. That money, the commission said, is reserved for passengers who were U.S. citizens at the time of the hijacking. Majid said he isn't interested in the money  he talks about donating it if he ever receives a check  but he is interested in justice. The hijacking happened early on Sept. 5, 1986. At the time, Majid was a young Pakistani with an airline ticket and dreams of studying in New York. Before takeoff in Karachi, Pakistan, four hijackers dressed as security officers boarded the plane with automatic weapons and explosives. The pilots escaped, leaving the plane and its 360 passengers grounded during a daylong standoff punctuated by the execution of an American. The hijacking reached a grisly end around 9 p.m. when the airplane's power went out. The attackers unleashed an indiscriminate barrage of bullets and grenades into the cabin, forcing passengers to flee through a side door onto the wing. There, they dropped 36 feet onto the tarmac below. Although Majid escaped the jet, he hasn't escaped the memories. They were so painful after the attack that he immigrated to America  and ultimately to Utah  to distance himself from them. His father begged him not to go, but Majid said he needed to "break free." "I wanted to move on," he said. "I didn't want to think about it. I didn't want to connect with anything. Utah was perfect for that." 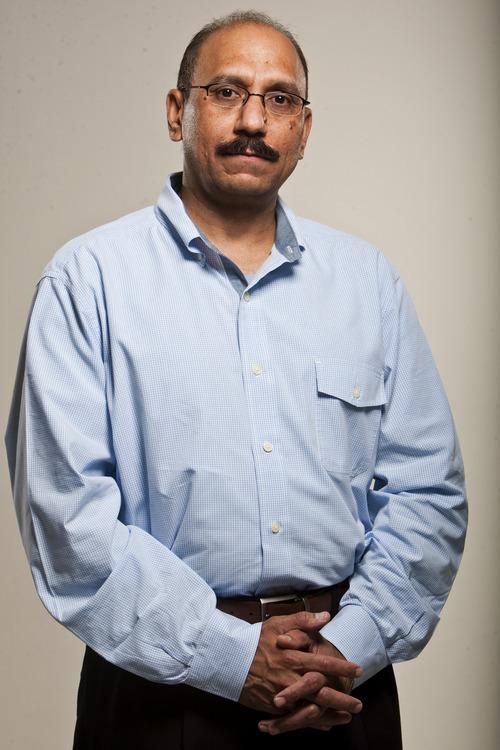 In 1994, eight years after the hijacking, Majid became a U.S. citizen. He now works as an associate fiscal administrator for Salt Lake County. Majid continues to mark the anniversary of the hijacking in silence. He seeks solace in the mountains. He takes walks near his Millcreek home. Flight attendants hiding American passports as terrorists take control of the plane. Hijackers uttering Muslim prayers, the same ones Majid prayed as a child, before turning their rifles on men, women and children. Passengers scrambling through seats to get to an exit door. Him running across the tarmac on a broken foot, without shoes, after an excruciating drop from the wing. A little girl in his arms as he lifted her, despite his own desperation, over a wall separating the airstrip from safety. "I was not sure whether I would survive or not," Majid said. Now, Majid faces another uncertainty. He wonders whether his hours aboard that Pan Am flight will ever be recompensed. His appeals to the federal government have been unsuccessful. "The commission has held that in order for a claim to be compensable, the claimant must have been a national of the United States," Foreign Claims Settlement Commission attorney Jack Guggenheim wrote in a letter to Majid. What weighs on Majid's mind are reports that the U.S.-Libya settlement is being shared by noncitizens as well. If the funds are restricted to the estimated three dozen U.S. citizens aboard that flight, so be it, Majid said. But if they are available to noncitizens, then they should be distributed fairly. 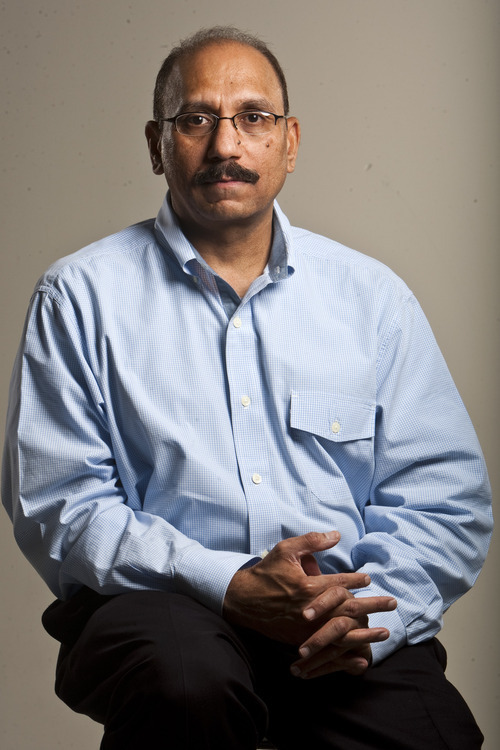 "I became a victim twice," Majid said. "Once at that time and now again due to the system. I'm still hopeful that America will take care of this injustice." Alyson Heyrend, spokeswoman for Rep. Jim Matheson, said the Utah Democrat's office looked into Majid's case. Although it was true that compensation had been given to noncitizens, she said it was awarded "in error and in violation of the statutes and rules set forth by the Foreign Claims Settlement Commission." 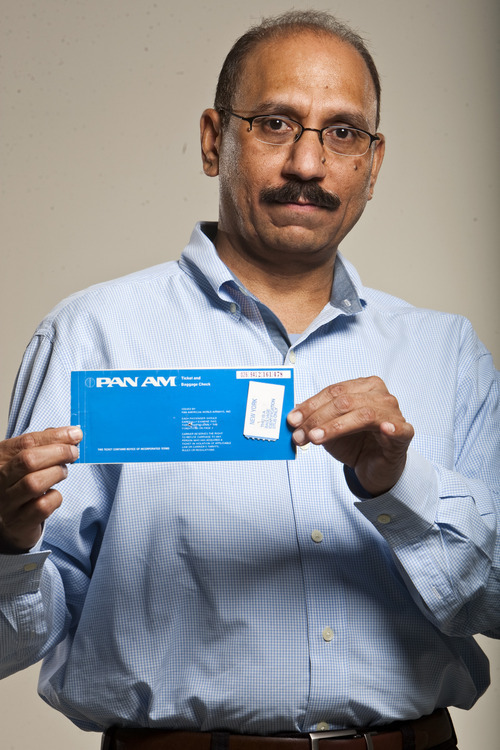 Now, with the change in Libya's government, Majid hopes that justice will come to every passenger  citizen or not  aboard Pan Am Flight 73. Perhaps a new government, he said, will help repair those old wrongs. On the morning of Sept. 5, 1986, four men wearing security uniforms stormed the stairway of Pan Am Flight 73 with assault rifles, grenades and plastic explosive belts. Flight attendants managed to alert the cockpit, allowing the pilots to escape through an overhead hatch. With the plane grounded in Karachi, Pakistan, a 16-hour stalemate ensued during which an American was executed. When the plane's power failed that evening, the hijackers turned on the passengers, firing rifles and lobbing grenades into a crowded cabin. Many passengers escaped through a side door, dropping nearly two stories onto the tarmac. Twenty people died that day and more than 120 were injured. The hijackers were arrested, sentenced to death and later released.